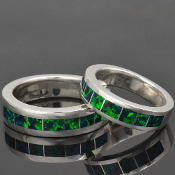 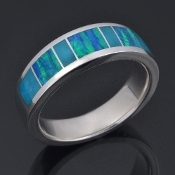 Our lab created opal rings for men are available in many opal colors inlaid in sterling silver, stainless steel, gold and platinum. 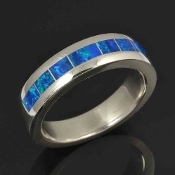 All of our lab opal rings are made to order in your ring size in 4 to 6 weeks and may be customized to your opal color choice. 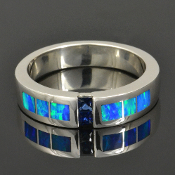 Our lab created opal rings are handcrafted by the Hileman family using only top quality laboratory grown opal and top notch craftsmanship. 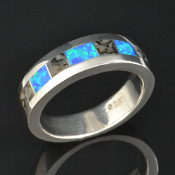 Lab created opal is an affordable and more durable alternative to natural opal. 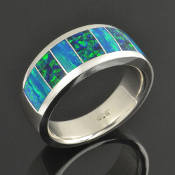 Lab opal has the same composition as natural opal with one exception- natural opal contains a small percentage of water and lab opal does not. 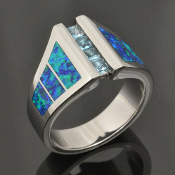 In lab opal the water is replaced with resin giving the lab created opal version more durability and making it less likely to crack. 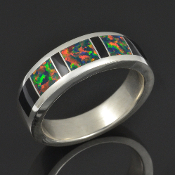 We take special care to cut the lab opal to mimic the random pattern in natural opal and break up the uniform pattern often seen in lab created opal jewelry. 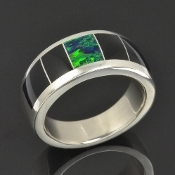 We recommend upgrading your standard sterling silver lab opal ring to Continuum sterling silver for added durability and tarnish resistance. 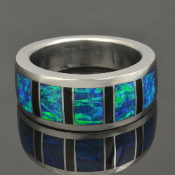 Read more about this great new metal option here.